Travel insurance can cover travelers whose trips are impacted by a winter storm, as long as the policy is purchased before the storm was named. Once a winter storm is given an official name by The Weather Channel, it’s considered a foreseen weather event, and it is too late for travelers to buy coverage for that storm. Expert Tip: For those with trips planned during the winter storm season and the holidays, Squaremouth recommends travelers purchase travel insurance shortly after booking a trip in order to ensure the best chance of coverage. 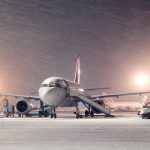 While travel insurance can provide coverage for flight delays or cancellations due to inclement weather, it doesn’t necessarily cover all inconveniences caused by bad weather. Poor road conditions and traffic jams typically aren’t covered by travel insurance unless a traveler is involved in an accident and prevented from getting to the airport or their destination. Expert Tip: Most travel insurance policies state a traveler must be delayed for 3 to 12 hours in order to be covered to cancel their flight. Squaremouth recommends that travelers particularly concerned with weather conditions look for a travel insurance policy with the shortest delay time required. If a winter storm causes travelers to be stranded at an airport for an extended period of time, Travel Delay coverage can provide reimbursement for meals and hotels during their delay until they are able to reach their destination. If the delay exceeds 12 hours, travelers may be covered to cancel their trip altogether. Expert Tip: Squaremouth recommends delayed travelers check their policy’s Travel Delay coverage parameters in order to ensure they fall within the coverage period and daily amount limits. Depending on the policy, travelers must be delayed for at least 3 to 12 hours before coverage becomes available. There is also a daily benefit amount, which typically ranges between $150 to $200 per person, per day. Squaremouth will be monitoring winter storms throughout the season and will be adding coverage information to our Winter Storm Travel Insurance Information Center as they impact travelers this winter.